Guys, your response to the sprinkle party has been overwhelming- sprinkles resonate with you apparently. I get that- they resonate with me too. And, bonus, Piper Jane is totally famous on pinterest right now. 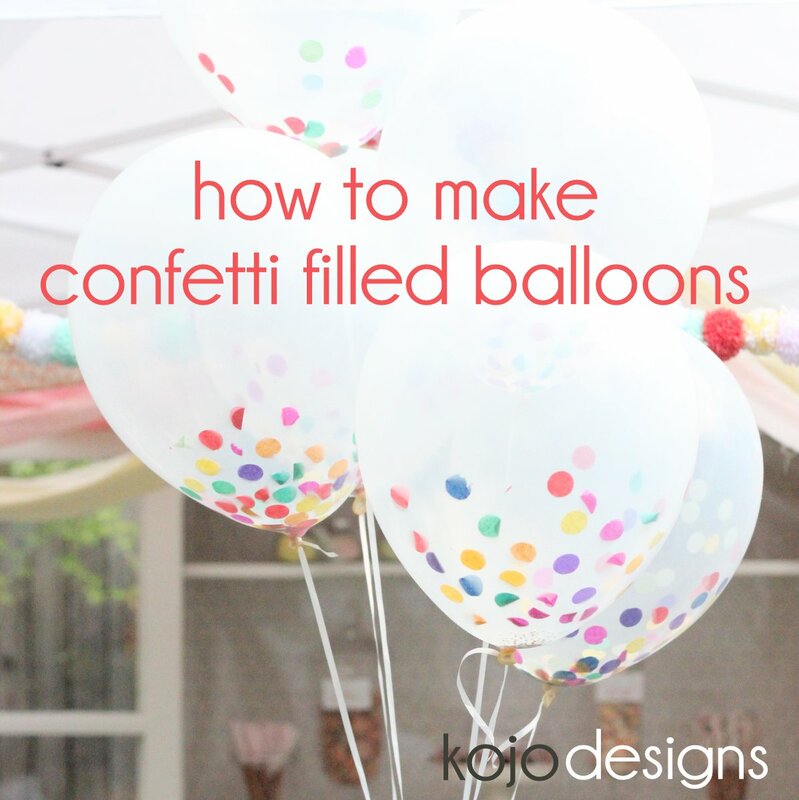 I keep getting questions about how to make the confetti filled balloons. They were super easy (seriously, SUPER easy), so I thought I’d put together a little mini tutorial in response to all of the comments/emails. To make a confetti-filled balloon bouquet, first, grab a clear balloon (I didn’t have any clear balloons left, so the one in the tutorial pictures is white). Then, grab a mini handful of tissue paper confetti. Fold the pile of confetti in half, and then in half again. 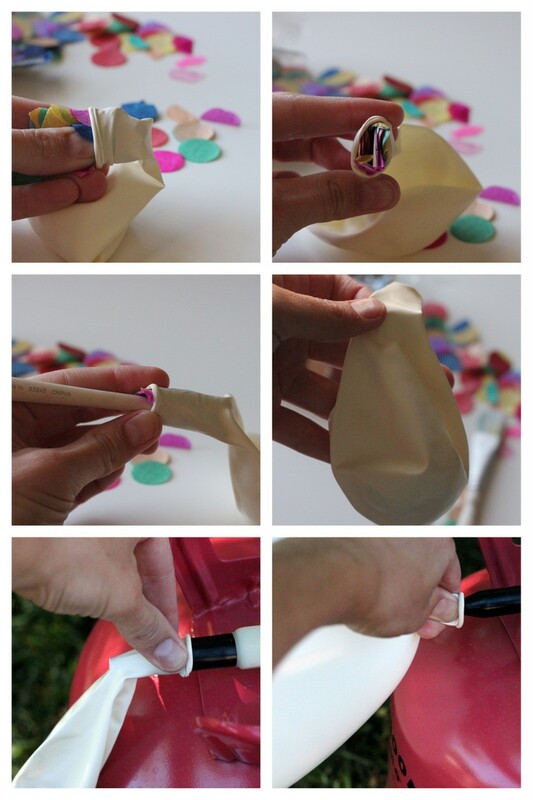 Once you have a little tube of confetti, push the confetti-tube into the neck of the balloon. Poke down until the clump of confetti falls into the balloon. Fill with helium (I got the helium tank at Target in the party section- it was plenty for the 20ish balloons we filled). Add a ribbon tie and you’re DONE! A couple of notes- you can use a funnel if you want (both the confetti-pile-folding and funnel were similarly easy). Also, after about an hour, the static seemed to pull the confetti up the sides of the balloon (making the balloons more fun and confetti-ish). For more sprinkle-y goodness- here is the Sprinkled with Love party, the sprinkle covered cake topper, and some sprinkle covered accessories. I simply love the way this looks!!! LOOOVE! I’ve gotta make these. I love these! Where did you purchase the confetti? I got the confetti at Party City! So clever. I love them. Thanks for sharing. Clear for sure- the white is tricky because you might not be able to see the confetti. 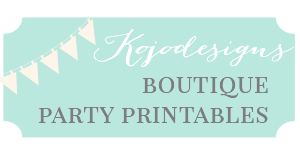 What a pretty and clever party idea! I bet she remembers it! I’m so in love with this idea. I’m plan on trying it out for my son’s 2nd birthday party in a few weeks. We’re having a donut party so the sprinkle idea fits right in. I just need to convince my husband why it’s important to buy a helium tank :-). Thanks for the tutorial. This look so pretty, we did it with sparkly confetti once, not so much fun when the balloons pop and the confetti is everywhere though! Charlotte, I love the idea of sparkly confetti (or glitter!). 🙂 We didn’t ever take the balloons inside, so I didn’t have to clean up any confetti messes- I bet they get confetti everywhere though. 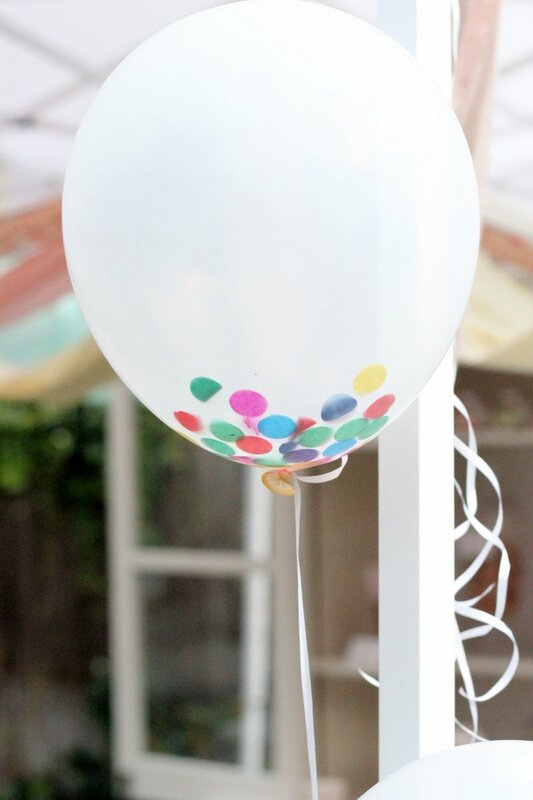 Linking from Celebratons at Home – These balloons are adorable! I think I’ll do them for an upcoming party. I’d like to use tissue that goes with the party – are the circles about 3/4″ or 1″? They are pretty small- maybe 3/4″? I just bought the confetti pack at Party City (it’s my favorite tissue paper confetti). Adorable! Is the helium necessary? Can you just blow them up the old fashioned way? Hi, Thanks so much for sharing this idea. I absolutely love it! Just wondering where you got your balloons from- Party City? I really like this idea, but the confetti doesn’t seem to pull up towards the side of the balloons even after 2 hours. Obviously, the static is missing. So, I want to know how did you create the static charges? Did it come about inadvertently as you inflated the balloon and it rubbed against your shirt? 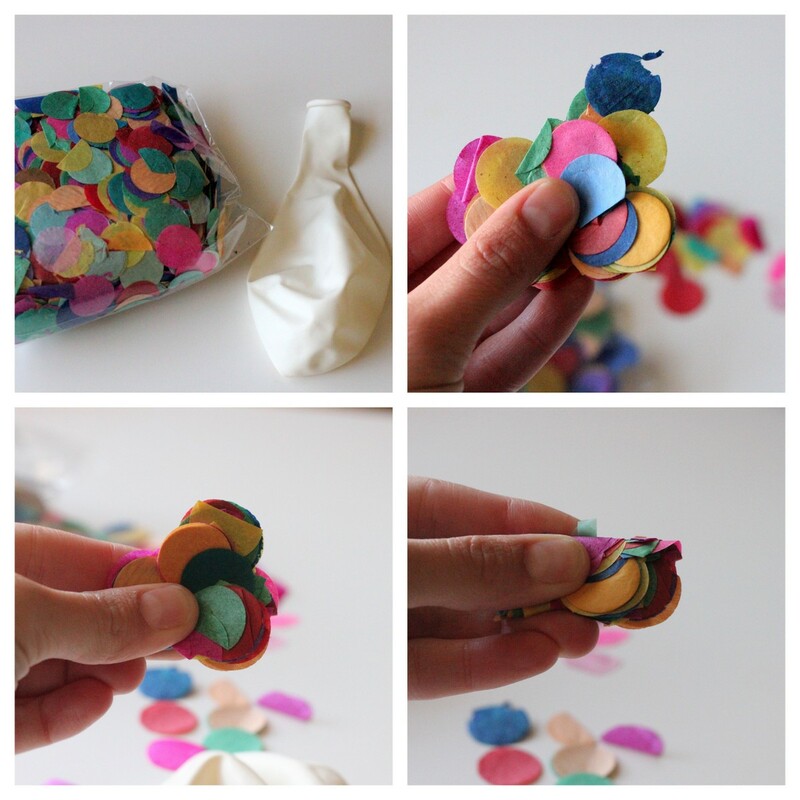 Where did you find the round tissue confetti? I can’t find it anywhere! Hey Erin, I bought it at Party City. I wonder if you could find it on amazon? Do you remember which ‘company’ on amazon you purchased the clear balloons from? 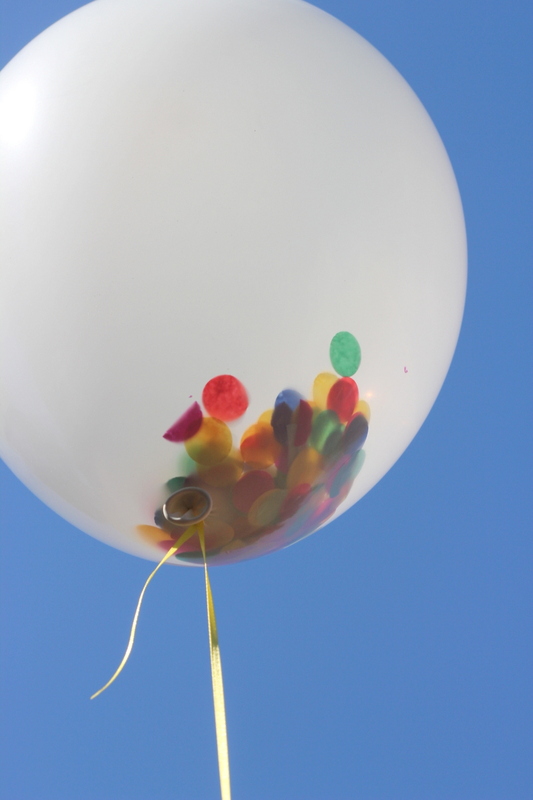 I’m reading several reviews of those who claim the balloons are not very clear… thanks! Meghan- I don’t remember which shop we ordered them from… sorry! Caroline, oh my goodness- what a great idea!!! Love this idea! They look so fun and festive. Just wondering…what did you have at the base of the balloons on the table? Hey Nan, I had the balloons staked into the grass with golf tees. Hope that helps! I LOVE confetti filled balloons. What I was wondering was have you ever used confetti with high float? I went to our balloon man today and we tried using the high float with metallic confetti and it kind of worked but I really like the look of the larger paper confetti. Did you buy that in bulk somewhere? I am checking out all of these balloon sources for my son’s reception in August and I need to figure out what is going to work. Hey Debi, I haven’t ever tried high float with the confetti balloons (but that seems like a good idea if you need these to last all day). I found the large paper confetti at Party City. Hope that helps! Thanks for the great tips I am about to make a bunch and hope it makes it way up the side too. I love it Shellie! It’s so tricky to try to predict- though I think it has something to do with getting the right amount of confetti (not too much) and also using really thin pieces of paper so they’re light enough to ‘climb.’ Good luck!